I -- The Apartments -- Apartments available for short-term rental are set out in specific lists in accordance with the reference numbers, location, position, district, section and category. Photos of each apartment are presented on our site, in addition to a brief description for the client to gain a clear idea of each unit on offer. II -- Requesting Information -- In order to request specific information about any of our apartments including fees, location on map, terms of reservation, payment, availability, minimal rental period and other details, the client is requested to fill out the form provided in • Booking information, without any further obligation or commitment. This will enable us to locate the apartments which best suit perceived requirements and reply to all specific inquiries. III -- Availability of Apartments -- In order to ascertain if the apartment required is available, clients should fill out the form provided in • Booking information. Once availability has been confirmed, the client may make a down payment to guarantee the reservation, as per the details to be supplied by our company. Shortly thereafter, confirmation of the reservation will be given and the receipt for payment received. IV -- Reservation -- Making the reservation constitutes an obligation to both parties, whereby all the standard conditions should be duly heeded. V -- Rental Period -- Once the terms of reservation stipulating date of entry and date of departure have been established and a down payment has been received by Copacabana Holiday Ltd., the client shall not be entitled to alter the rental period. VI -- Cancellation -- Should the contracting party (client) decide to cancel the reservation, amounts paid shall not, under any circumstances, be reimbursed, whereby any down payment made shall remain with Copacabana Holiday. Furthermore, no reimbursement shall be made in any circumstances if the client should cancel the rental contract after having paid the full amount of rent stipulated. VII -- Occupancy -- The prospective tenants shall notify Copacabana Holiday with respect to the number of people who shall occupy the apartment, providing a listing of the full names of all occupants at the time or prior to the moment of receiving the keys to the apartment. VIII -- Handover of Keys -- Handover of keys to the apartment shall be arranged after full payment of the total rent agreed in addition to a security deposit for possible damages. IX -- Checklist -- All apartments to be rented shall feature a checklist, which is an integral part of the rental contract, to be checked by the prospective tenant and an employee of Copacabana Holiday prior to receipt of the keys of the apartment by the tenants. The checklist will include all the furniture and fittings in the apartments, the location thereof, state of conservation and working condition of all the fittings and fixtures. X -- Cleanliness -- All apartments shall be delivered to the client in a clean and tidy condition and shall be vacated at the end of the rental period in the same condition as when the tenant was admitted. XI -- Utilities (electricity and gas) -- All tenants shall be required to defray the costs of all electricity and gas used during the rental period. XII -- Animals -- No animals are permitted to enter into or remain in the rented apartments. XIII - Vacating Rented Apartments - All premises shall be vacated before midday of the day following the last day of the rental period. XIV -- Rental Payment -- Rent shall be paid in advance prior to, or at the moment of, occupation of the apartment by the tenant. We would remind customers that such payment may not be made by check or credit card. 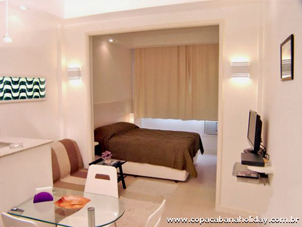 XV - Security Deposit -- In addition to the rent to be paid in advance, the tenants shall also leave a security deposit with Copacabana Holiday, to guarantee against possible breakage of furniture and fittings. The stipulated amount shall be notified in advance, in accordance with the apartment to be reserved, and the security deposit shall be returned after the apartment is vacated and the checklist verified showing everything to be in order. XVI -- Rental Amounts -- The rental amounts for each apartment shall vary in accordance with the length of the rental period, time of year (high or low season) and also depending on of any special demands made by the client. For this reason, all rental amounts to be charged will be notified pursuant to receipt of an enquiry. XVII -- Fines -- The tenant shall be responsible for any fines that may be incurred due to violation by the latter of any laws, the convention or internal regulations of the building in which the apartment is located. Payment of the fine shall be made over to Copacabana Holiday, as soon as the landlord/owner is notified as to the motive and value for same.